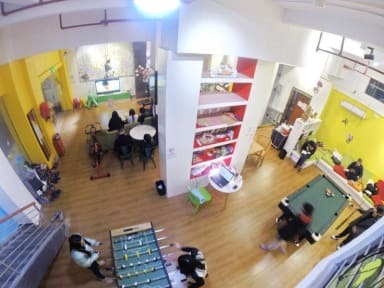 Just a 4 minute walk away from the metro, Lazy Gaga is the FIRST hostel ever built in the VERY CENTER (Zhongshan 6) of Guangzho. We push our 'NO CURFEW' to new climax that you can cook, drink, watch movies, play POOL, FOOSBALL, Wii, guitar at ANY time you like because our common area is well isolated from the sleeping rooms area. Local cheap beer is sold starting from 4 yuan only. Within a 15 minute walk, our guests can WALK to most prized historical attractions, the popular riverside bar area, historical parks, and the two most popular shopping streets, Shangxiajiu and Beijing Road. We're also surrounded by fleets of supermarkets, more than 100 restaurants, the prosperous Yide Road & Shisan Hang Wholesales Market, prominent museums, the founding temple of Zen Buddhism, and the VISA office. Our facilities are tailor-made to enhance your comfort in every possible way. FREE public kitchen, FREE access to more than a thousand movies (including 3D movies), FREE WIFI, FREE luggage storage and the CHEAPEST laundry are available. We've also introduced some of the biggest bunk beds in China, which are complemented with soft mattresses, duvet blankets, and duvet pillows. Security is top priority. We design our own charging locker which is equipped with a power outlet inside the locker, so that you can charge your expensive gadgets in a secure way. Padlock freely provided for sure! Additionally, our hostel is gated and open only to guests. The place is like a member's club house exclusively for you. Serving different needs is taken sacredly. Whether you're on halal, kosher, vegetarian, vegan or even vegan gluten-free, our friendly English-speaking staff is ready to give you support and assist you in exploring the city. Come and help us rock this newly born hostel! Check-in begins after 13:00 on the date of booking. If you arrive at midnight (after 12:00 AM), please book the previous night. For early arrival, please feel free to chill at the communal lounge, take a shower in the public bathroom and store your luggage for free. For check-in later than 18:00 because of delayed flight or train, please notify us by email in advance. Otherwise your bed may be resold. The hostel operates 24 hours. No curfew. No lock-out. Great hostel. One of the most beautiful hostels I have ever seen. You can find anything you need. It also provides with the largest beds I have ever seen (in a hostel, obviously). I stayed in this hostel for 3 nights in a 6 bed female room. I didn't find good facilities there. The shared bathroom was old, no hand soap, very tiny sinks and just one mirror outside the bathroom. You can do the laundry by yourself on the rooftop, a little dirty and the dryer doesn't work well. If you need towels, you have to buy them at reception. There is a kitchen, always dirty and with few utensils. The common area smells cigarettes. The staff was not helpful with my requests. The hostel well located, close to the metro and the guys at the reception are ok. They gave me a room but there was no free bed for me. They made me switch room to another with four beds and toilet/shower inside. There was a small window that opened in a dark space, hidden with a courtain. Well, if you move the courtain you can see rats outside the window! Since it is closed they can't get it inside, but it's absolutely horrible and risky for guest healt. Horrible experience. Personale veramente scontroso , pulizia della camera pessima , posizione ultra scomoda . BACKPACKERS ANDAte altrove !! !